A “lean” manufacturing system refers to a manufacturing method that minimizes waste thanks to concepts like just-in-time production, in which inventory is only purchased and used when an order for the corresponding product is placed. Lean manufacturing was popularized on a large scale thanks in part to the Toyota System, which was developed by manufacturing professionals in Japan during the early part of the 20th century. 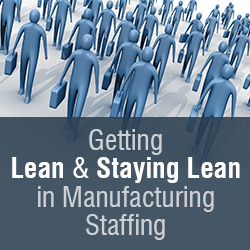 The idea of lean manufacturing can also carry over to the field of manufacturing staffing. Getting lean in manufacturing staffing requires a close review of your current staffing procedures so that you can identify areas where you can work to eliminate waste. When it comes to manufacturing staffing, waste is anything that slows down the process of attracting and retaining top talent to your manufacturing company. Waste might include inefficient recruiting procedures that waste valuable time on an employee search, or outdated onboarding processes that slow the rate at which new hires can become fully assimilated into their new roles. Fortunately, with the right approach to identifying manufacturing staffing waste, getting lean in manufacturing staffing is possible for any organization. The first step in eliminating waste is taking a look at your hiring process. To reduce waste in this area, you must target the right people with the right set of skills. This reduces the chances that you hire someone who is not a good fit for your operation. A bad hire can create a tremendous amount of waste. The U.S. Department of Labor estimates that a single bad hire can cost a company 30% of potential earnings in the first year the person is employed. To minimize waste in the hiring process, refine your candidate pool and be sure that you are seeking out employees with the skills and experience required for your organization. For those concerned with getting lean in manufacturing staffing, onboarding is another important area to eliminate waste. According to The Wynhurst Group, 22% of turnover occurs within the first 45 days that a new hire is brought on, which is usually during or just after the onboarding process. To lessen the waste created during onboarding, Jobscience suggests eliminating a dependence on paper forms and using a cloud-based storage system to maintain compliance with pertinent laws and hiring regulations. It is also important to think about the structure of your onboarding process and how invested your organization is in this process. 76% of companies have some kind of formal onboarding process, but only 7% of training budgets are put towards programs for it. You can overcome the deficiency in onboarding investments by making sure that your process covers everything your new hires might need to know about your operation and addresses this information in a thorough manner. A big part of keeping your manufacturing operation lean is holding onto existing employees already trained instead of hiring new ones who need to be brought up to speed. Retention eliminates waste by making sure that more well-trained workers are employed in your manufacturing operation than inexperienced ones. IndustryWeek says that one of the best ways to improve employee retention in manufacturing is to ramp up your employee benefits. These benefits can include everything from employer-provided insurance policies to flexible vacation time. A lean staffing process can encompass many parts of an organization’s hiring and retention policies. By examining your existing procedures and methods in these areas, you can begin to understand where you have room for improvement to make your staffing lean and better achieve the goals that your manufacturing operation needs to reach. 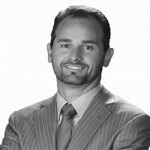 Louis Flory is the President of Effex Management Solutions, a large volume contingent workforce management solutions provider. Louis has been in the staffing and management industry for 16 years and in his spare time enjoys golf and playing sports with his two children in Houston, TX.